Traces of ancient viruses which infected our ancestors millions of years ago are more widespread in us than previously thought. A study shows how extensively viruses from as far back as the dinosaur era still thrive in our genetic material. It sheds light on the origins of a big proportion of our genetic material, much of which is still not understood. The scientists investigated the genomes of 38 mammals including humans, mice, rats, elephants and dolphins. The research was carried out at Oxford University, the Aaron Diamond AIDS Research Centre in New York and the Rega Institute in Belgium. It is reported in the journal Proceedings of the National Academy of Sciences . One of the viruses was found to have invaded the genome of a common ancestor around 100 million years ago with its remnants discovered in almost every mammal in the study. Another infected an early primate with the result that it was found in apes, humans and other primates as well. The work established that many of these viruses lost the ability to transfer from one cell to another. Instead they evolved to stay within their host cell where they have profilerated very effectively - spending their entire life cycle within the cell. 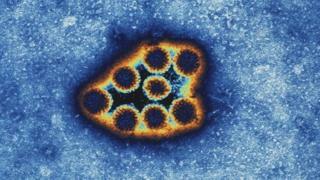 The researchers found evidence of the viruses multiplying so extensively within mammals' genomes that they have been compared to an outbreak of disease. The senior author of the study, Dr Robert Belshaw from Oxford University's Zoology Department, said: "This is the story of an epidemic within every animal's genome, a story which has been going on for 100 million years and which continues today. "We suspect that these viruses are forced to make a choice: either to keep their 'viral' essence and spread between animals and species. Or to commit to one genome and then spread massively within it." The study shows that the viruses involved have lost a gene called Env, which is responsible for transmission between cells. Known as endogenous retroviruses, these micro-organisms have gone on to become 30 times more abundant in their host cells. The study is one of many attempting to understand the full complexity of the human genome. Astonishingly, only 1.5% of the genetic material in our cells codes for human life. Half of the rest is sometimes described as "junk DNA" with no known function, and the other half consist of genes introduced by viruses and other parasites. According to the lead author, Dr Gkikas Magiorkinis, "much of the dark matter in our genome plays by its own rules, in the same way as an epidemic of an infectious disease but operating over millions of years. "Learning the rules of this ancient game will help us understand their role in health and disease." This raises the extraordinary scenario of our DNA serving as an environment in which viruses can evolve - a micro-ecology within the double-helix of our genetic material. There is evidence that they can provide positive services. For example the protein syncytin - derived from a virus - helps develop the placenta. Dr Belshaw says that endogenous retroviruses (ERVs) are not known to have any obvious or direct health effects. "But there could be effects we're not picking up on or things we could even take advantage of if we detect ERVs moving around or expressing proteins as a result of cancer or infection." The study was supported by the Wellcome Trust and the Royal Society.